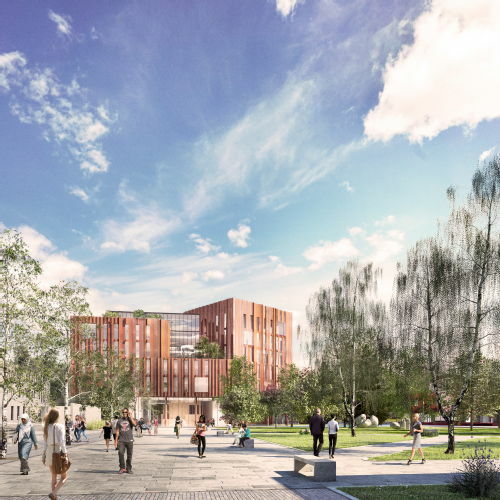 We’re excited to report that work to design a new Faculty of Arts Building has progressed a great deal since the University announced the winner of the RIBA competition for its design (Feilden Clegg Bradley Studios) earlier this year. Extensive consultation with staff and students prior to the competition produced a clear ethos for the new building. Now, working closely with the architects and the Estates Office, the Faculty departments have begun to engage with the detail of the actual look and feel of the new building and to explore how it will support teaching and research excellence into the future. Our vision for the new Faculty building is to create a space that is open, inviting and flexible, enabling collaboration, creativity and innovation to flourish. A space that will act as a hub both for public engagement in the arts and humanities and for nurturing cultural value. A space, most importantly, that will unite all of the Faculty of Arts departments from Millburn House and the Humanities Building under one roof and provide specialist facilities to support their work. Furthermore, it will be a building for everyone on campus, with a range of mixed teaching and study spaces, lecture facilities, a café and exhibition space for our entire community to enjoy. The budget has formally been approved by the University Council but there is still much work to do before finalizing the design and appointing the contractors. We’ll be at work on that from now until early 2019, when the project is due to start construction. The building is expected to be completed in 2021.